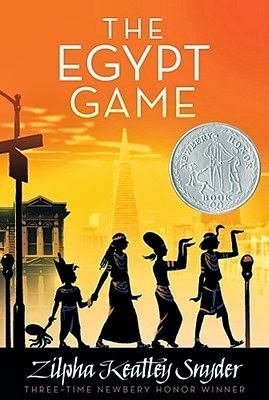 The Egypt Game by Zilpha Keatley Snyder. Grades 4-7. Atheneum, 1967. 215 pages. Review copy from childhood. The first time Melanie Ross meets April Hall, she’s not sure they’ll have anything in common. But they soon discover that they both love anything to do with Ancient Egypt. When they stumble upon a deserted storage yard behind a curio and antique shop, they find the perfect place for The Egypt Game. Suddenly wilted wildflowers become lotus blossoms, a lean-to shed becomes The Temple, and an old birdbath becomes an altar. The girls turn into high priestesses and Melanie’s little brother Marshall becomes the boy pharaoh. As the game gets going, it also begins growing and before long there are six Egyptians playing instead of two. But when a girl is murdered in the neighborhood, the game, with its sacrificial fires, evil gods, and death ceremonies, suddenly becomes all too real. Who's behind the murder? Could it happen again? Is the Egypt Game in danger? For kids who, like me, identify with April and Melanie's creative spirits and want to read about more kids who create amazing worlds with their imagination, I'd suggest Bridge to Terabithia by Katherine Paterson and Doll Bones by Holly Black. Both books will make kids feel the feels. For kids who are fascinated with Ancient Egypt and would like to read more about it, try The Treasury of Egyptian Mythology by Donna Jo Napoli.